A 10-year-old girl (11 as of Slam, Bam Birthday Bash) born on July 7, Pucca is the series' titular character of the series. She is hopelessly in love with Garu, and is constantly trying to kiss him. 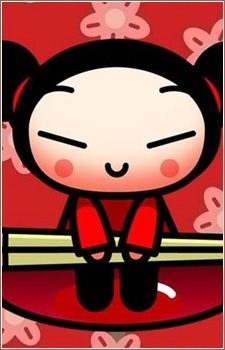 Rather than speaking, Pucca communicates with giggling, kissing, growling sounds, and occasional short words like "hello", "tada", and "yu huh!". She has also been seen cheering "G-A-R-U" with Ching on one occasion in episode Tokyo-A-Go-Go when Garu was Sumo Wrestling and on another occasion "A-B-Y-O" when they both acted as cheerleaders in the episode Ninjitsu for Dummies. She and Garu also both sing in Hooray for Bollywood! (despite their voices are completely different than the occasional noises that they make). Pucca lives with her guardians, the three Master Chefs at the Goh-Rong restaurant, where she works as a delivery girl, driving around town on her red scooter. She has a pink cat named Yani, who flirts with other cats, but is only interested in Garu's black cat, Mio. Although she is not a ninja, she has demonstrated some unique abilities of her own that make up for what she lacks in training, such as immense speed, strength, and a rock-hard head. Her superhuman abilities are not always necessary for her to save the day, however, as she's extremely present-minded and resourceful. Though she is typically sweet-natured, Pucca has a very bad temper, a reckless attitude, and when another girl is seen interested in Garu, Pucca angrily charges for the girl and (usually) tends to "beat her up". Pucca has very long black hair, but usually wears it in an odango style. The only times her hair is out of her usual style is in episodes Ghost Of A Kiss (though it is her ancestor, whom looked exactly like Pucca), Ring Ring's Party Favors when she was blasted out of the Goh-rong when Ring Ring uses her opera voice, destroying most of it, and her hair ties snap off and He Loves Me Not where her hair was flowing from an unusual power. Pucca is also a talented musician, as evidenced in And the Band Played Rong, Sooga Size Me, and a few other episodes. Most likely out of a desire to protect him, Pucca often takes over where Garu (unwillingly) gives up. Pucca also has an alter-ego named "Noodle Girl" that sometimes appears in the series. It is revealed in the episode Tomb It May Concern that Pucca is Uncle Dumpling's, Ho's and Linguini's niece (Though not which side of the family they come from), although this was the only time it was ever touched upon. though the back of some of the Pucca DVD cases also state that the chief's are Pucca's uncles.